Brass hinges, with LOCKABLE door latches, and wall brackets to hang. 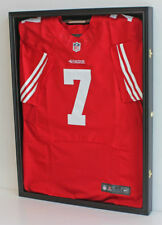 We provide the pin-board for you to pin the jersey on for display. That works best for Football or Hockey Jersey. You can also custom cut the pin board yourself to make it work for baseball jersey. Boxing Single Cards. Hockey Boxes & Cases. Hockey Card Lots. Hockey RC Lots. Hockey Single Cards. Wrestling Trading Cards. Football Boxes & Cases. Football Single Cards. This ball was autographed by A.J. McCarron. The autograph is not aligned with the ball so please carefully review the photos before choosing to buy or offer on this listing. JULIAN EDELMAN. NEW ENGLAND PATRIOTS. Signed Patriots white panel full size football. This white panel football is inscripted with "HOF" This signature was certified by Beckett Authentication Services. It includes a tamper proof sticker with matching serial numbers to card. Certification can be verified and viewed through the third party's online database. 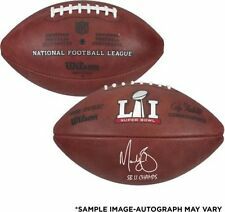 Devin McCourty, Kyle Arrington, and Kyle Love Autographed NFL Football Patriots Football. Man Cave Authentication Hologram Decal. Johnny Unitas signed football with PSA certification. Shipped with USPS Priority Mail. Matt Schaub. Owen Daniels. Andre Johnson. NICK FOLES. JACKSONVILLE JAGUARS. Signed composite leather Wilson NFL 1455 football. NICK CHUBB. Signed composite leather Wilson NFL 1455 football. CLEVELAND BROWNS. The football was signed in silver marker at a promotional signing in Los Angeles. It includes a Certificate of Authenticity from Tnahsin83181 Collectibles with the exact details of where and when this was signed. 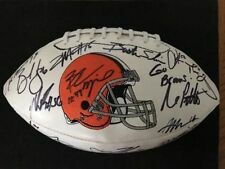 This is a Hand Autographed Football of Nick Chubb of the Cleveland Browns. This is a Logo Football. You can view this item on the SpenceLOA website and it shows when and where the item was signed. 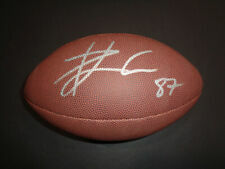 This is a Hand Autographed Logo Football of Chris Doleman of the Minnesota Vikings. You can view this item on their website, it shows when and where the item was signed. This is an official NFL leather football which has been personally autographed by Warren Moon. This item includes a certificate of authenticity from James Spence Authentication (JSA) and Denver Autographs. 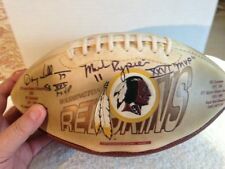 This is a Hand Autographed Football of Rayne Dakota "Dak" Prescott of The Dallas Cowboys. This is a Dallas Cowboys Logo Football. You can view this item on the SpenceLOA website and it shows when and where the item was signed. This is a New York Giants logo football personally autographed by Odell Beckham Jr.
Pictured is the exact item that you will receive with COA! I am a collector myself and know the importance of condition of the POP's. Up for sale is an END ZONE PYLON signed by Steelers star James Conner. James signed this at a public event here in Pittsburgh. Please see the pic of James signing this exact ITEM IN THE LISTING. 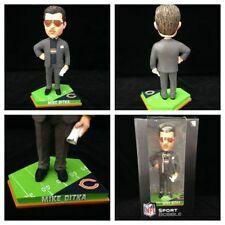 100 % authentic autograph guaranteed. Better proof than coa. 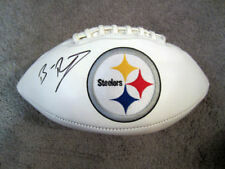 HINES WARD Signed this Boldly with a Steelers “ BLACK” Sharpie Pen AS PICTURED. HIGH GRADE Personally Autographed Pittsburgh Steelers Jersey #86 as Pictured. We are pleased to offer this full size football signed by Raiders Hall of Fame legend, Fred Biletnikoff. He added a whopping 4 inscriptions, including HoF 88, 589 Receptions, 8974 Rec Yards and 76 TD's. Condition is excellent. The item comes with a JSA certificate and matching sticker on the football. Shipping to the Continental US will be $8.00. Please email with any questions. Thanks for looking. Dan Marino Autographed Football. Upper deck COA. Official Wilson football. Football shows minor wear. 100% g u ara n teed authentic. You can rest assured that your order will make it there in one piece. 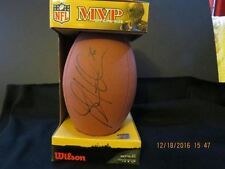 Deion Sanders Autographed San Francisco 49ers Logo Football With JSA W Authentication This is a Hand Autographed Football of Deion Sanders. This is a San Francisco 49ers Logo Football. You can view this item on the JSA website and it shows when and where the item was signed. JOHN MADDEN AUTOGRAPHED NFL WILSON FOOTBALL Signed Auto HOF in box Box Oakland Raiders. Shipped with USPS Priority Mail. Local pickup available in the chesterfield or southwest city/the hill of St. Louis area. He played college football at Maryland. Pittsburgh Steelers logo football. The signing of this item was witnessed by JSA. Authentication: JSA COA. Distinguished workmanship, material and design. Upgraded 1-1/2"interior depth offer more space for you to DIY a unique jersey frame. Click for Full Description.